Although the portable photographic camera was already invented, to take a snapshot was extremely expensive and the plaque used was too fragile. This is why the Americans got to know the west only by paintings. Like John James Audubon with birds, Bingham worked landscapes with characters from the basins of the rivers Mississippi and Missouri, in the USA. Bingham named the work as French trader – half-breed son but, when the painting was acquired by the American Union of Artists, they changed its name to Fur traders descending the Missouri. 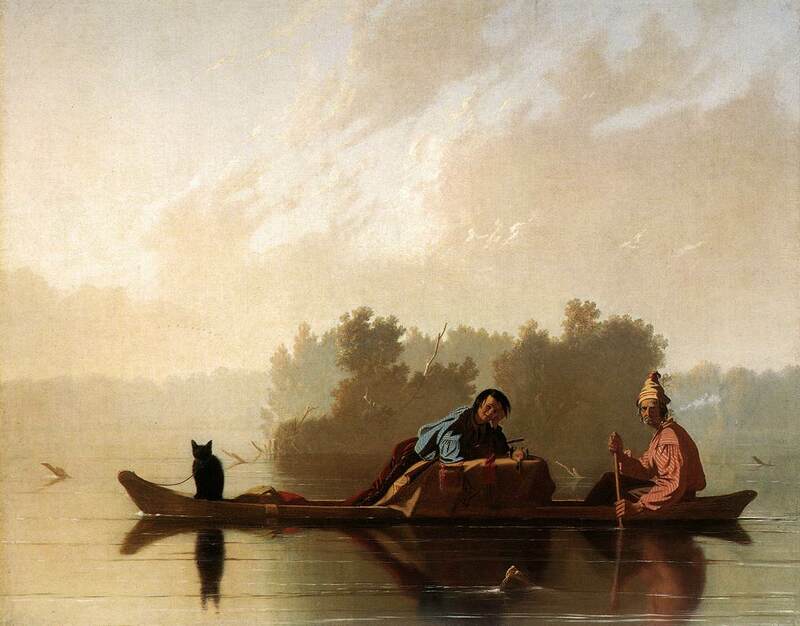 There we see a French fur trader and his son descending the Missouri river on a canoe with their goods. The composition is completed with a bear cub tied on the bow (which looks more like a cat, but specialists reached to the conclusion that it is really a bear cub, I don’t know why) and a dead duck over the furs. Like the first name of the work states, the son is a mix between a French fur trader and a Native American woman. It was very common in that time for a French trader to take a Native American woman as a wife. And this fact gives the work its exoticism. If you ask me, I think the canvas doesn’t function that well. The background is calm, subtle and nice; and both the reflection and the texture of the water are really admirable. But when we get to the canoe and the main characters, the lines are hard and the colors are too flat. If we look closely, the shirts of the trader and his son seem to bight on themselves, interrupting the general composition. But beyond the technical analysis, the work is historically interesting. ~ by Álvaro Mazzino on December 9, 2010. Hi there colleagues, good article and nice arguments commented at this place, I am in fact enjoying by these. This entry was posted on December 9, 2010 at 10:09 and is filed under Realism.You can follow any responses to this entry through the RSS 2.0 feed.You can leave a response, or trackback from your own site.